2. 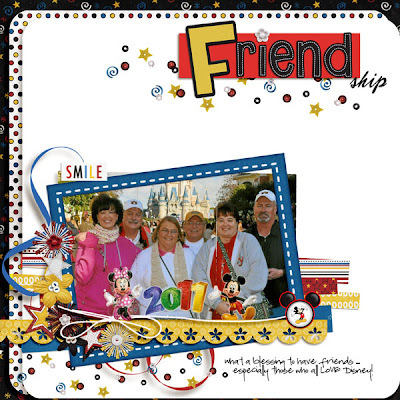 Use at least 2 different patterned papers and one solid paper. You may use more, but this is the minimum. 3. Use one paper for your background, no stacking. You can have smaller mats, paper strips or blocks, but only one background paper. 4. I want to see 2-4 mini clusters, no big clusters. Think in terms of a mini cupcake vs. a full size cupcake. I want your clusters to be bite sized. 6. Use two alphas or fonts or a mix of both for your title. 7. Date, journal at least a line or two, and add your finishing touches. You choose your pictures and kits ... just make sure to list them when you upload to the gallery so those designers are given credit. 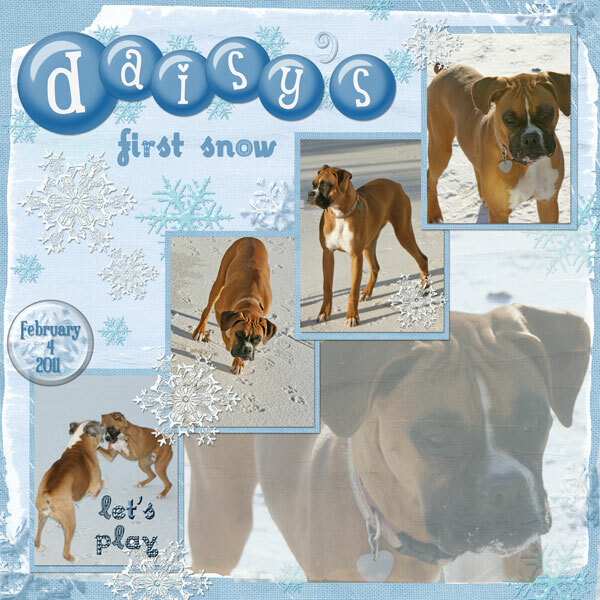 For this layout I used Template Freebie #16 by MJ-AJ Designs, Crash Test Dummy by Natalie's Place Designs, Crash Test Dummy Add-On by Natalie's Place Designs, Fonts: Crazy Harold & DJB Smarty Pants. 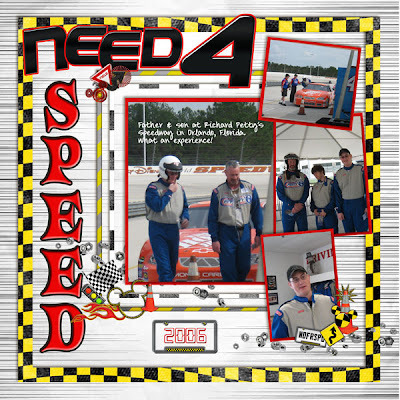 Hope you enjoyed this explanation of a speed scrap and thanks for dropping by! 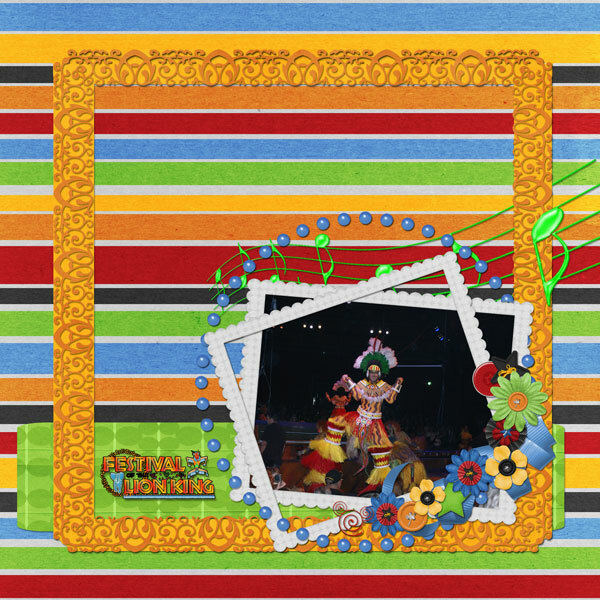 I used Gettin' Wild by Natalie's Place Designs and Blend It Masks by Happy Scrap Girl. Tonight Mouse Scrappers is having a Speed Scrap at 7:00PM CST. Come join us!!! I'm now hooked on the Scraplift Challenges ... here is my latest layout for this challenge. 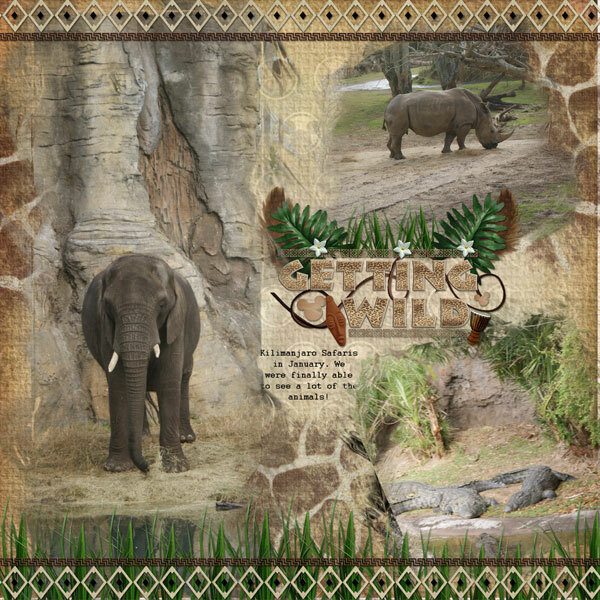 I used "Main Street Magic" by Connie Prince and "Jungle Party" by Natalie's Place Designs. I hope you have a wonderful week and thanks for dropping by. 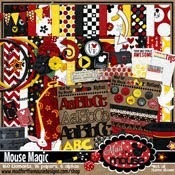 There is a new challenge at Mouse Scrappers and it is a lot of fun! It's called a Scraplift Challenge. You are given a layout and you are to scraplift it as you see it. This is my first time doing this challenge ... here is my layout. I used the "Once Upon a Time" kit from Kellybell Designs. I finished a Template Challenge there today too ... here is my layout. Now this was a super fun layout because of the story behind it. We were at Animal Kingdom before it officially opened to have breakfast at the Tusker House. There was a man ahead of us just strolling and looking around. We immediately recognized him from a Disney special we saw on the Discovery channel showing the story behind Expedition Everest and its construction. 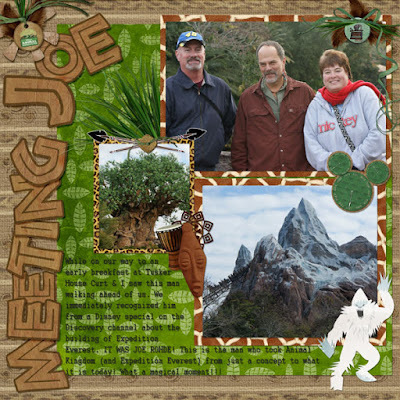 His name is Joe Rohde and he took Animal Kingdom (and Expedition Everest) from concept to what it is today. He was so nice while we gushed over him ... ha! ... then posed for a couple of pictures with us. 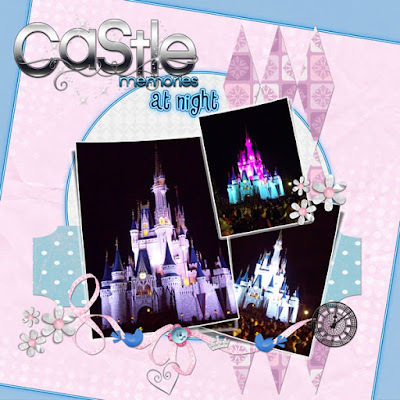 Now that was a fantastic magical memorie!!! Such a dreary day outside ... ugh! The girls (Shasta & Daisy) are keeping me company ... I'm supposed to be getting ready to go to my weekend crop, but I started playing with these rosette flowers. I wanted to make some to match a Disney project I'm planning to work on. I learned how to make these by watching here. I decided to use some of the Tim Holtz Gloss paper and alcohol inks to make some of the rosettes and then some of the paper I will be working with. I'm not a big fan of the glue gun ... so some of my centers are not centered, but I did get better as I went on. You can even double stack some to give it a more dimensional look. 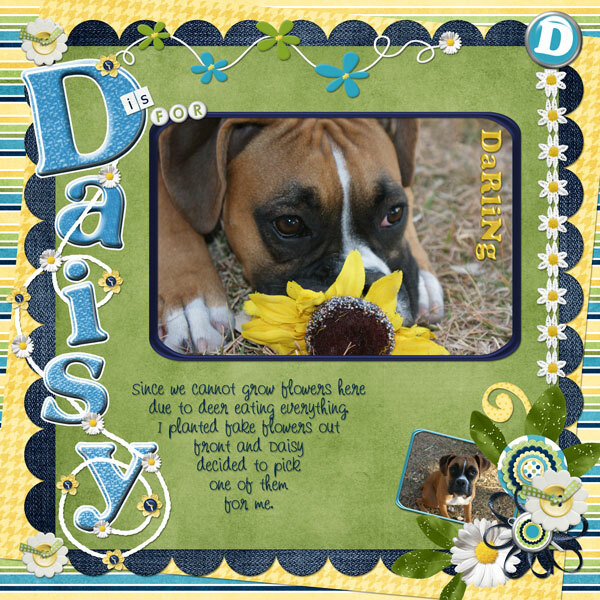 Was super busy today getting ready for my weekend crop with The Scrapbooking Factory. Really looking forward to spending some days with everyone! So, with that I didn't post my Happy Birthday Bryan message. Yesterday we celebrated our son's 22nd birthday! 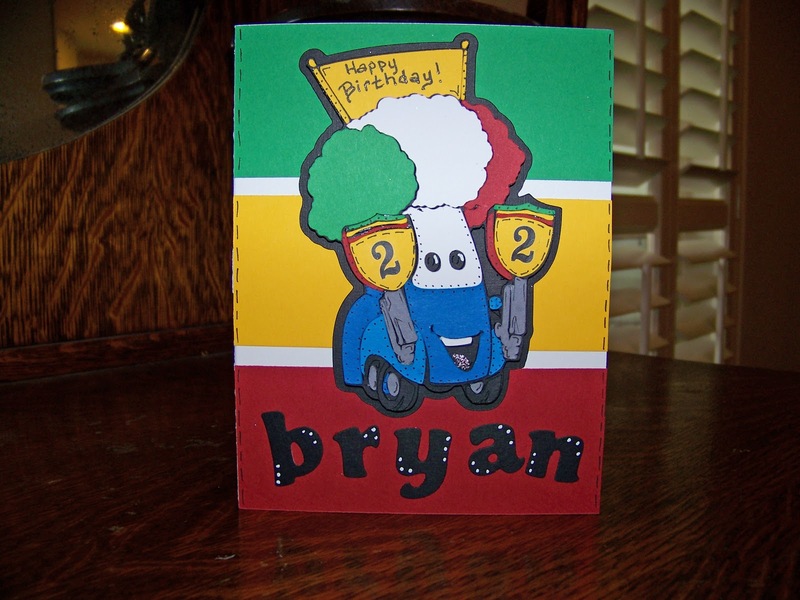 I always make a card for them so it was funny when he saw this years card ... Guido from Cars! I just got this cartridge and really wanted to do this cute little guy. Just too funny ... happy birthday Bryan ... love ya! I hope everyone has a wonderful Valentine's Day! My sweet hubby made me breakfast this morning ... what a treat! This is the card I made for him this year. Last year I filled the heart with little candies and they are still in that card. He didn't want to "ruin" the card by removing them ... so this year I didn't fill the heart with candy! See, I learn sometimes! I had such fun with this. 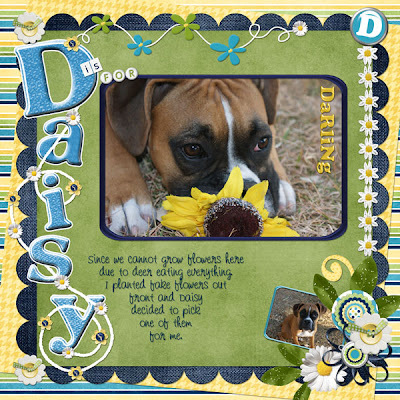 I used a digital kit (the new collab kit from Scrap Matters). I printed out the tree, the "warm fuzzies" saying, and the cute little porcupine (I just had to add a bow). I am sooooo not an artist and when I drew our initials in the tree and attempted to surround it with a heart. Well, as you can see it looks like a paw print ... ha! He loved it anyway and I am blessed daily having him as my sweet hubby. Another beautiful day here!! We just got back from a walk with Daisy ... so that made it even more fun. We got to stop and visit with some neighbors, which made her day. I love sitting and working on my template challenges while enjoying the view outside ... mainly enjoying seeing the sunshine outside. Here is the latest challenge I finished at Mouse Scrappers. 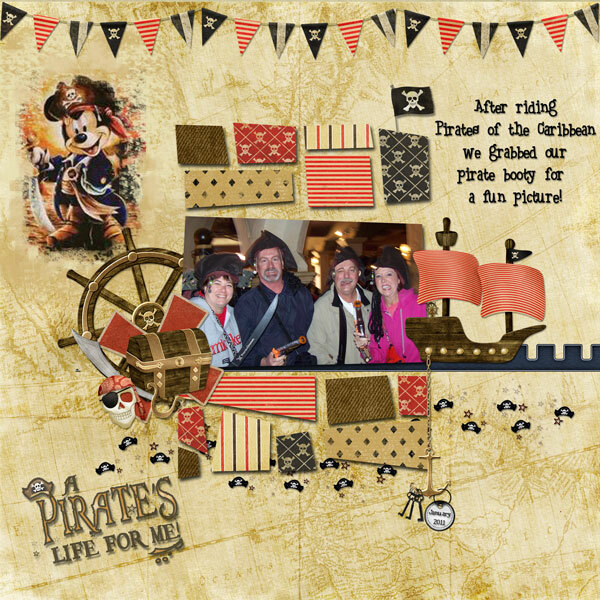 I used the Black Pearl kit by Misty Cato, Pirate Mini by Kellybell Designs, Date Dangly Doos by Connie Prince, and I found my pirate Mickey clipart through google. Most of my pirate pictures are me and my girlfriends when we go to Disney each year. It was so much fun to actually get a pirate picture with Curt in it! Hope you have had a relaxing weekend ... thanks for dropping by! What a beautiful day we had today. I even had my windows open for awhile ... got a little chilly after a bit. Still loved seeing the sun! I decided to do a layout from Meghan Mullens new kit called "D is for ...". It was full of daisies and the colors just matched my mood today. Of course, for me "D" is for Daisy ... she just turned eight months old. While she can be a handful at times, she is such a sweet puppy! I just received the cutest picture for Valentine's Day from my sweet friend, Karen. Thank you so much for this! We had such fun at Disney with you, Guy, Wren and David ... good times! I used Mouse Mania kit by Julie Billingsley, Snipettes: Enjoy the Moment by Sahlin Studios, Just Plain Fun Bonus Alpha by Britt-ish Designs, Mickey Buttons by Designed by Roxana, and the template is by Kathleena! This just makes me smile Karen ... big hug!! We are finally all warmed up. Today we had the windows open enjoying the sunshine and breeze. What a switch from just two days ago, but that's what living in Texas is like. Ha! What fun it was to watch the dogs enjoy the cold weather. Shasta wasn't as enthusiastic about the cold, but at almost 11 years old it just doesn't thrill her. Now Daisy on the other hand LOVED IT! She just ran in circles and then tried to lick up all the snow she could get. What a great way to celebrate turning 8 months old! The major highways of San Antonio are shut down. They showed the streets this morning with NO ONE on them! It is so pretty to see even this small amount of snow, but don't want a repeat any time soon. We haven't gotten above 26 where I'm at in three days. Today is supposed to get above freezing. Of course, the dogs love this! This is Daisy's first snow (expect a layout soon). She keeps licking the snow and biting at it. Shasta just enjoys the brisk weather. I'm off to scrap some snow pictures! Thanks for dropping by.